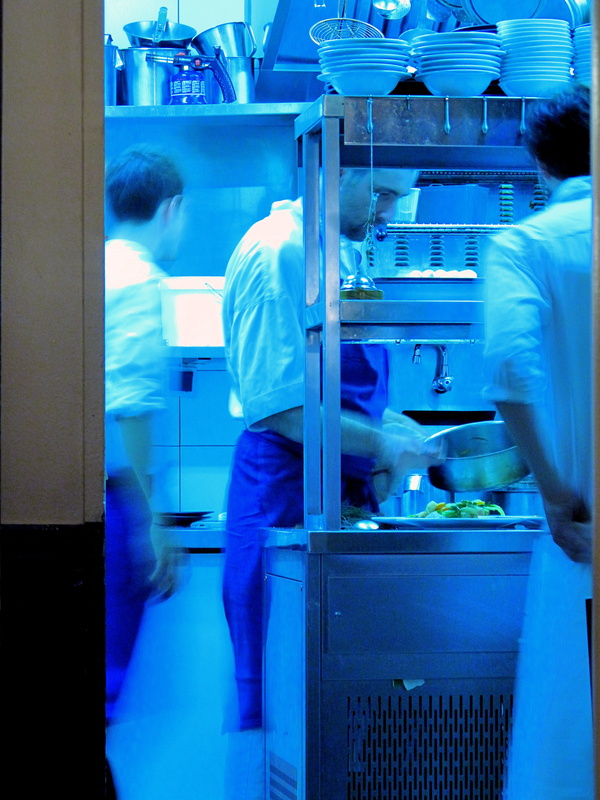 Iñaki Aizpitarte could be the coolest chef in Paris. Tall and swarthy, wearing three-day-old stubble and pastel yellow socks, he can often be seen behind the bar of Le Chateaubriand entertaining his regular chic clientele that includes actors, artists, media-types and, of course, foodies. Recently, the chef has received serious praise and been invited to show off his cooking in such cities as Madrid, Copenhagen, Melbourne and nearly New York (he was unable to participate at Omnivore NYC as he had forgotten to renew his passport), but in actuality, he became a chef really by accident and relatively late in life. The youngest of five children, Aizpitarte was born in Besançon then brought up when a teenager in Hendaye – basically the closest French town to the Basque homeland from which his parents fled to escape General Franco’s regime. After finishing school, he set out on his own only eighteen and penniless. A string of sundry jobs followed: he was a stonemason with Compagnons du Devoir in Angers (‘they were too strict, it lasted two months’); a landscape painter alongside his uncle in Dax (‘I enjoyed the mornings in the gardens’); before arriving in Bordeaux to study oenology (he attended five lectures in five years). In 1999, with only five-hundred Francs to his name, the twenty-six-year-old Iñaki decided to visit Israel. There, he ended up washing dishes at the Rozata restaurant, where he ‘helped when they were in the juice’ – no surprise then that Midnight Cowboy is his favourite film. Impressing the Serbian chef, the Frenchman was soon put behind the stove – ‘he taught me the basics,’ he says, ‘I knew instantly that’s what I wanted to do. That was it.’ A subsequent spell touring Latin America preceded his return to France and arrival in Paris. Cooking school was not an option financially so he taught himself whilst working his way through the city’s kitchens. 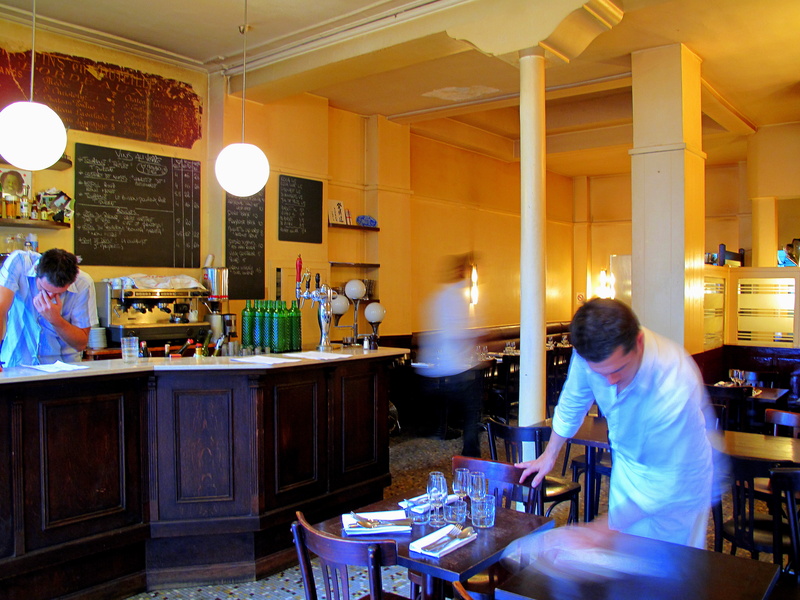 He began at Café des Délices under Gilles Choukroun, who would later become influential as head of one of the new waves rippling through French gastronomy. In 2003, Aizpitarte moved to la Famille in Montmartre where he first caused controversy and won acclaim for his creative cooking. Two years on and he was at Transversal, Laurent Chareau’s restaurant within the Mac/Val modern arts museum in Vitry-sur-Seine, just outside of Paris. Dishes here were inspired by the exhibits – the chef once served a course comprising just a single, peeled apple pip. Another two years later and he was ready for his own venture. 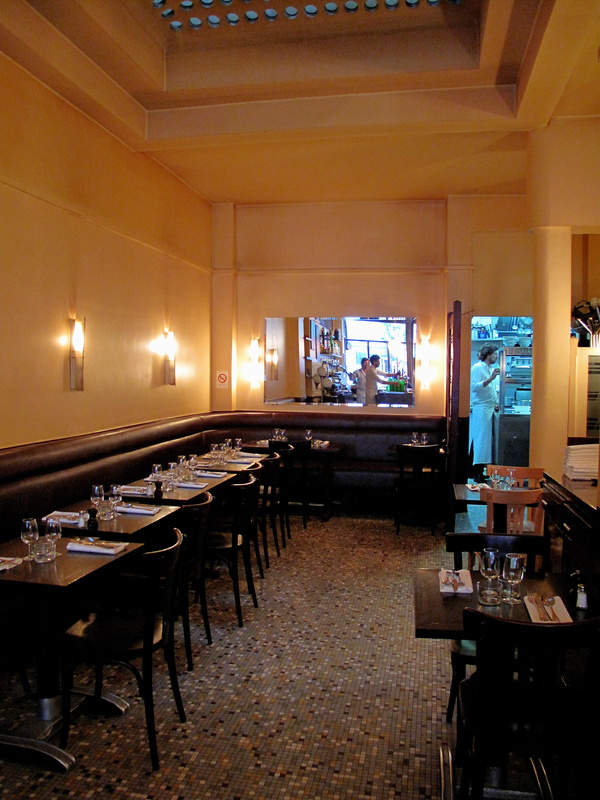 Thus, together with Frédéric Peneau, the former owner of Café Burq whom he first met whilst at la Famille (the pair were practically neighbours), he bought a historic bistro near Belleville in April 2006. it was an instant hit with its immediate success underscored domestically by being declared Le Fooding’s Best Restaurant (2006) and worldwide by the San Pellegrino Breakthrough Prize (2008). The old bistro, once a grocer, was a serendipitous discovery. 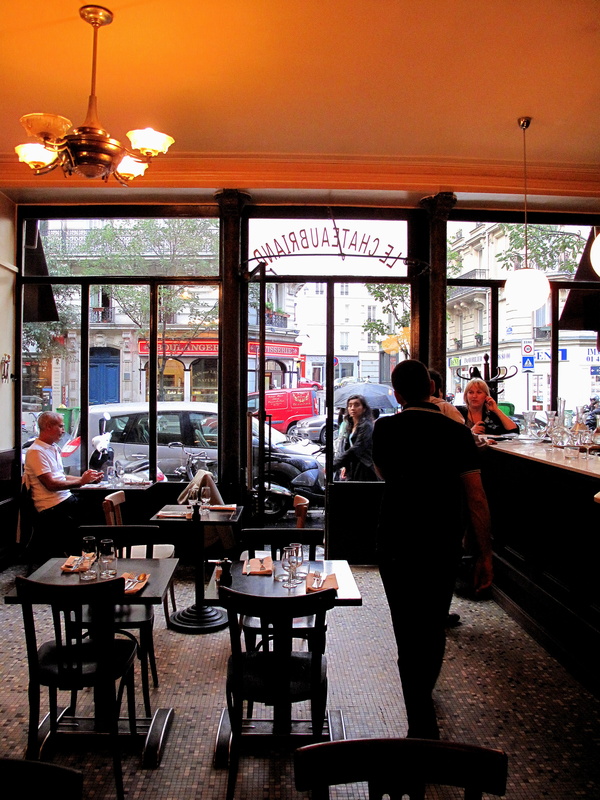 Located on a large, sycamore-saddled avenue close to Goncourt, the restaurant’s wide-open façade sitting within its small burgundy frame barely sticks out from the street’s shops. Having kept the same name, Aizpitarte and Peneau also kept the same time-worn, masculine interior. A vintage zinc bar rests upon dark rosewood on one side of the space with espresso machine, heavy-duty slicer, shelved drinks bottles and chalk-scribbled blackboards behind. Hard chairs and naked tables, snugly set as if in a canteen and fashioned from the same deep, roseate timber, clutter the colour-speckled grey mesh-mosaic floor. Creamy, almost empty walls are skirted by a metre-or-so of burgundy. 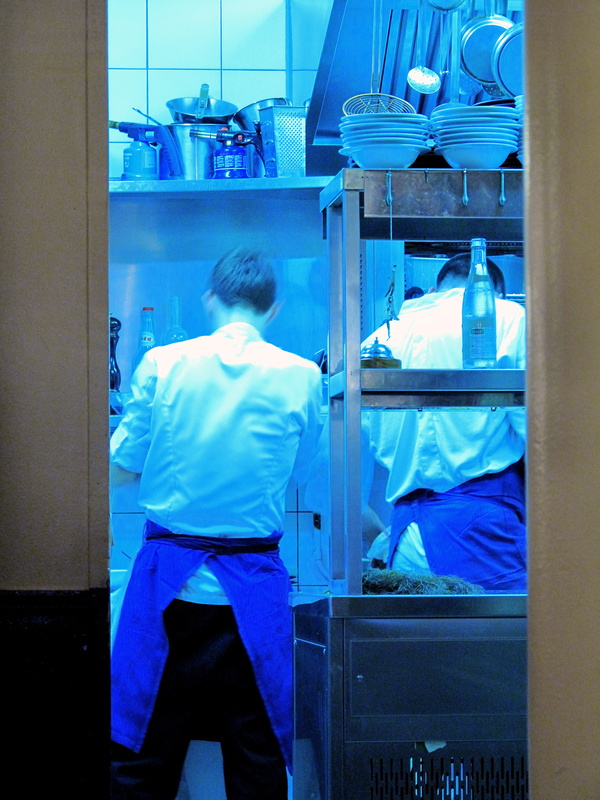 A third, much larger blackboard bearing the names of the chef’s friends hangs in the room’s centre whilst a wall-to-wall mirror lines the backend of the restaurant near the somewhat exposed kitchen. Lighting is from two chandeliers, three glass globes and a perforated skylight on the high ceiling, but the space still remains rather dim. A service station on which loafs of bread are freshly cut stands near the bar. 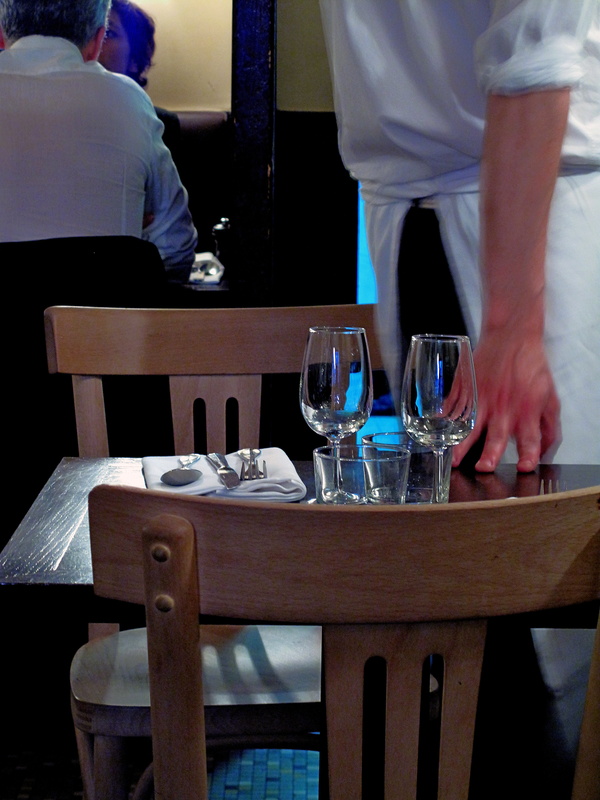 Tables carry cutlery and simple glassware. 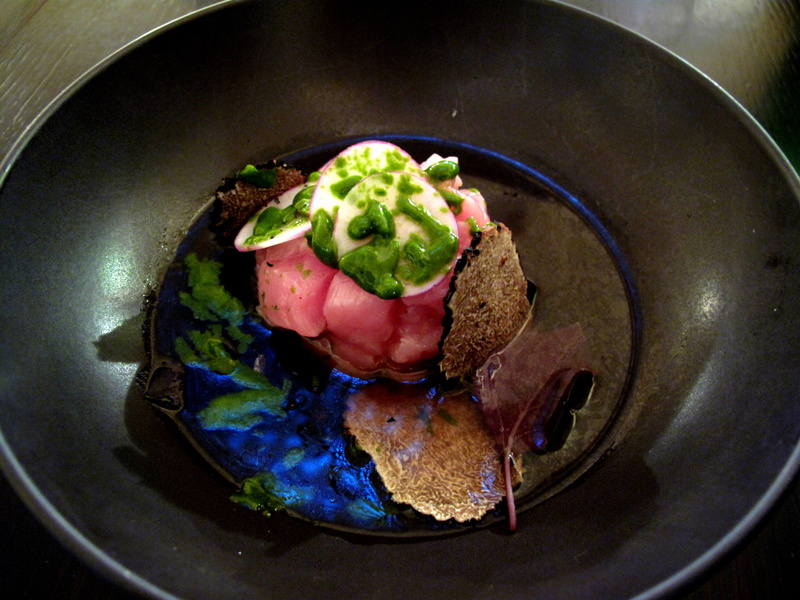 Amuse Bouche 1: macquereau, shiso, pastèque. 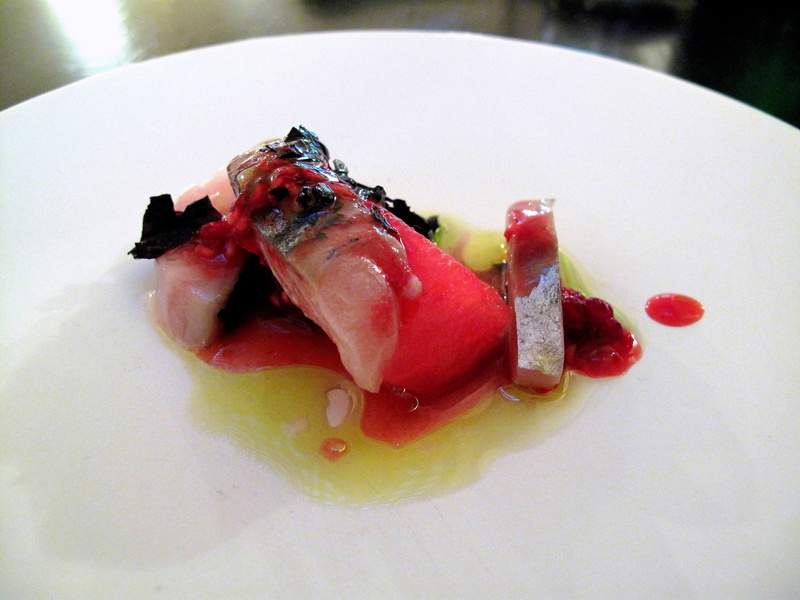 A neat slab of watermelon, overlaid with a sliver of olive-oil-marinated mackerel, sat in smoked Japanese rice vinegar along with two more morsels of the macquereau; shiso and crushed raspberries, whose bright red juice dribbled into the dull yellow vinegar, were sprinkled sparingly over all. The fruit and mellow vinegar’s light acidity cut the richness of the tasty fish whilst the latter also added some welcome woodiness. The watery, sweet melon balanced the shiso that was at first bitter then peppery and slightly astringent. Le Pain: pain de levain. 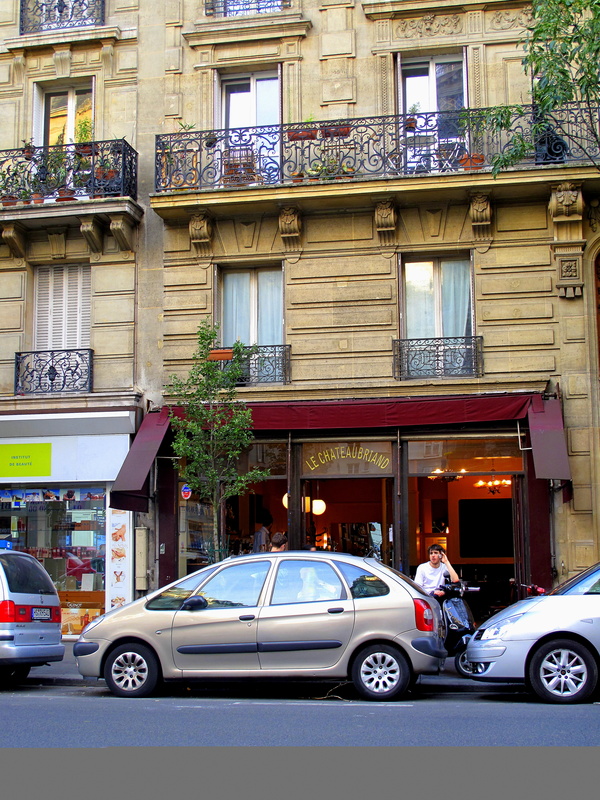 Bread was bought in from arguably Paris’ best baker – Poujauran. 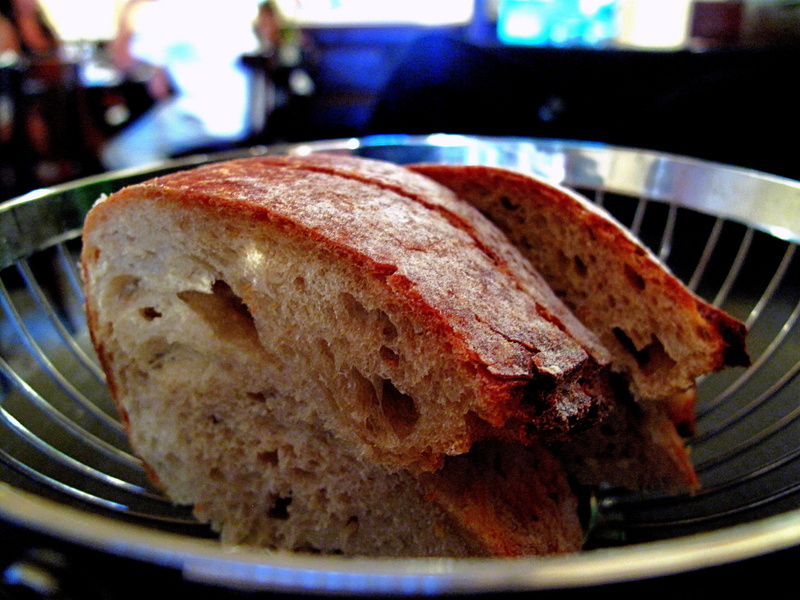 The sourdough, freshly sliced by the serveurs as needed, was fluffy with tangy, yeasty crust. Butter was not served. Entrée 1: veau de lait, langoustine, truffe d’été. 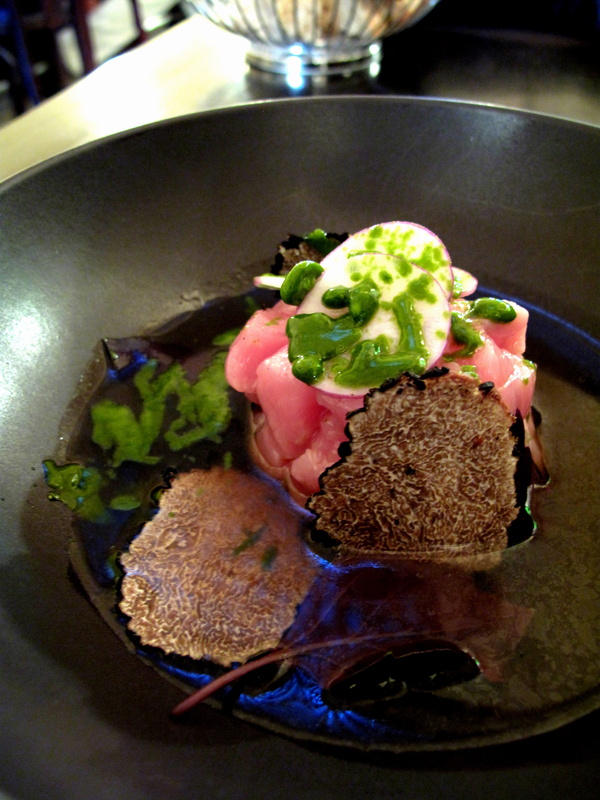 A heaped pile of cherry pink milk-fed veal chunks, crowned with skinny cross-sections of radish, was semi-submerged in an opaque langoustine jus littered with large shards of summer truffle and blades of red basil; deep green pistou glacé came smeared across the top of the tartare as well as afloat. Supplied by the city’s finest boucher, Hugo Desnoyer, the delicate and tender meat’s quality was immediately clear. However, it was also completely overwhelmed by the strong shellfish jus, itself almost spicy, whilst the truffle proved little more than decoration. The herby pistou provided a slight relief, but not enough. Plat Principal 1: lotte, jardinière de légumes. 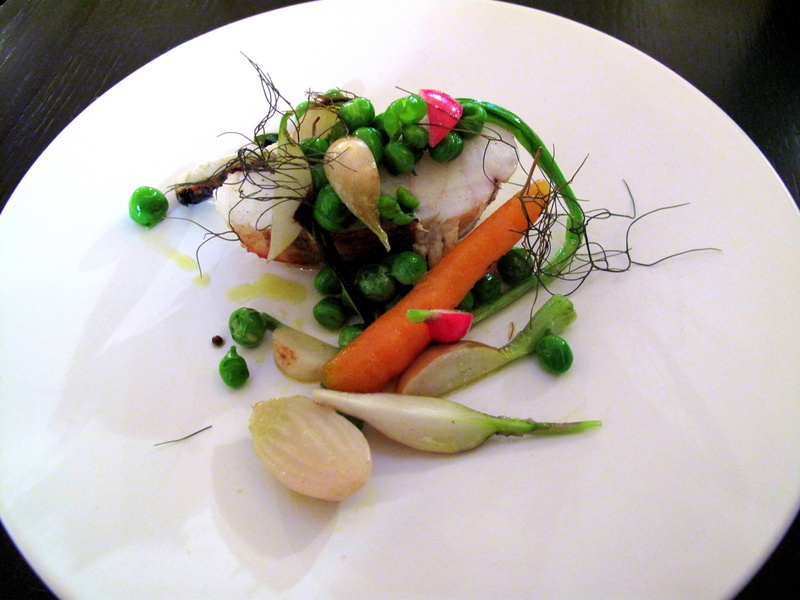 Pan-fried slice of monkfish tail, coated with vadouvan, was accompanied by a collection of vibrantly-coloured vegetables drizzled with a dab of olive oil and garnished with toasted fennel fronds. The familiar yet exotic scent of curry came through slowly, but convincingly from the blend of onions and Indian spices that stained the ivory skin of the nicely-seasoned, succulent fish, which, barely cooked, retained its juicy firmness. The fresh greens, simply served whole, halved or quartered, unpeeled and tops intact, arrived in various degrees of rare – from well-charred spring onion to untouched petit pois. Plat Principal 2: carré d’agneau de Lozère, artichaut, chèvre, olive. 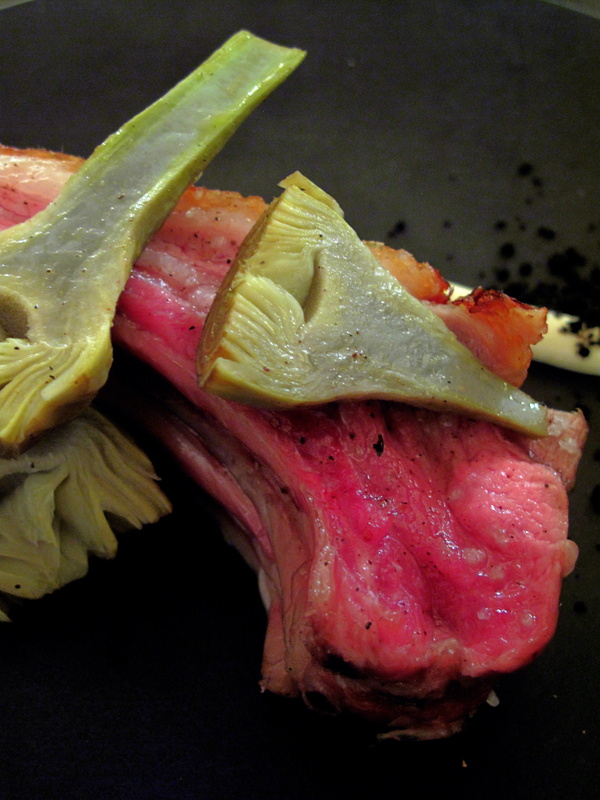 Double-cut Lozère lamb rib chop was plated with bisected baby artichokes and a streak of fromage de chèvre Ardéchois that was peppered with olive crumble. Another Desnoyer delivery, the lamb was delicious – the carnation rose meat almost raw with just the fatty outer coat cooked and crisped amber. The classic combination of artichoke, creamy goat’s cheese and black olive at once suggested Provence, although the crumble was actually rather dry and lacking taste. Dessert 1: fraises, chantilly. 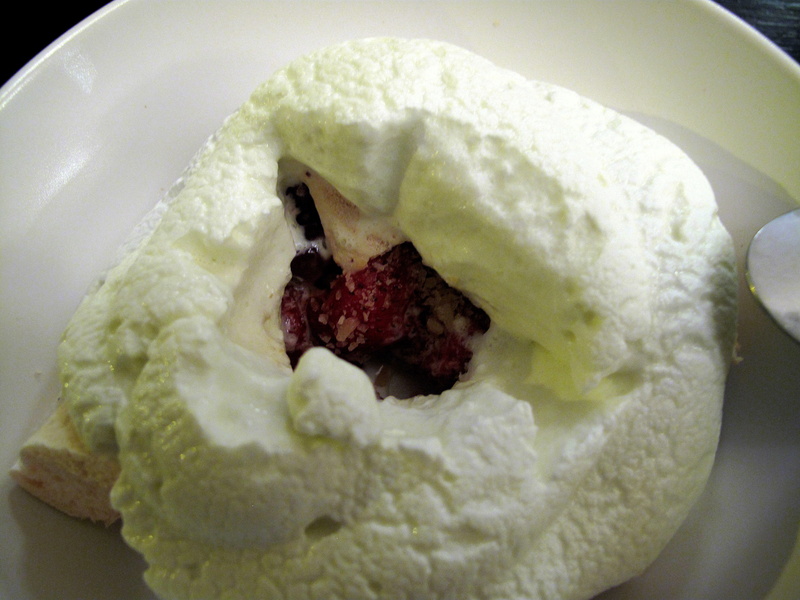 A bowl bore deconstructed pavlova aux fruits rouges or even Eton mess. 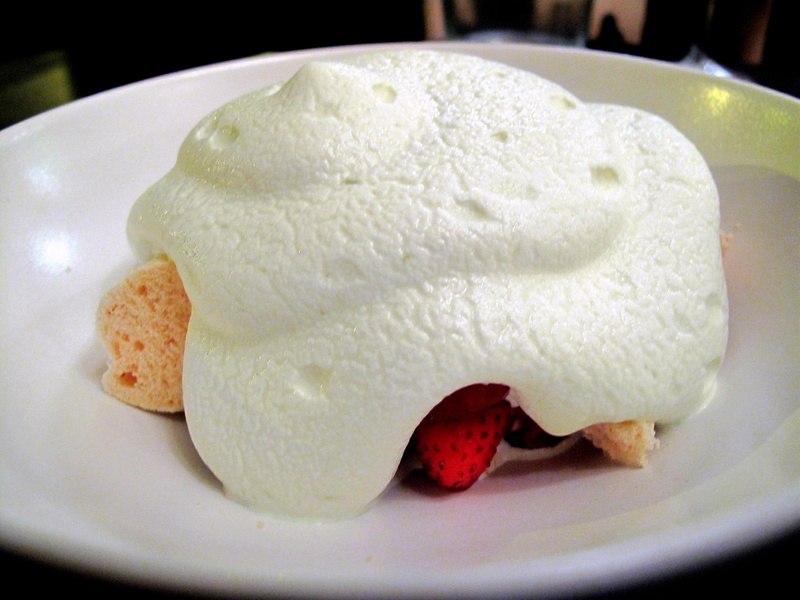 Sweet, plump strawberries were the base upon which brittle, sugary meringue was set, before both were immersed in a cloud of velvety smooth verbena Chantilly cream. Beneath the alabaster blanket were buried chips of sucre pétillant whose surprising effervescence corresponded pleasingly with the herbal verbena. The staff here, all men and almost all long-haired and bearded, are often labelled as eye-candy – but this description detracts from the fact that they are actually good at what they do. Efficient and helpful, they were also relaxed and friendly; even as the evening wore on and the restaurant filled, they remained patient and eager. Indeed these very fittingly macho, but affable Basque-esque characters only contributed to the charm of the place. In addition, there was an undeniable, sensible buzz about the room from the intimate bobo crowd that pervaded the space and nearly spilled out onto the street through the bistro’s open front. My thoughts on the menu itself were mixed. Watermelon and mackerel, being an unusual yet intriguing combination, made the amuse bouche exciting to receive but, although decent enough at the time, eventually forgettable. The entrée of veau and langoustine, an interesting take on terre et mer, was effectively bland and all the worse given the excellence of the meat. 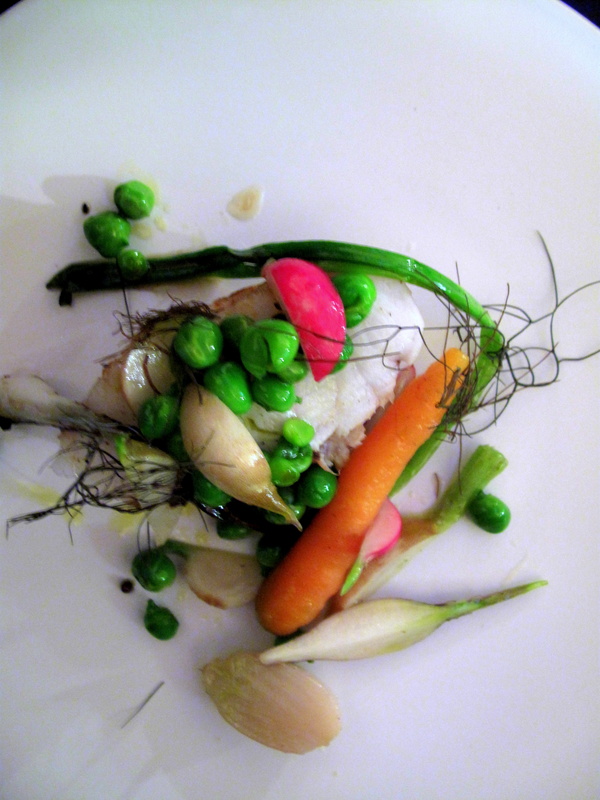 Dinner only really began with the lotte, jardinière de legumes. This straightforward dish was light, tasty and quite right for summer. The next course was the best of the evening. The mouth-watering carré d’agneau was superb, even if the artichokes were admittedly unmemorable and olive, unsuccessful. The dessert was a refreshing, fun finish. Simplicity and deconstruction appear to dominate Aizpitarte’s style. The chef has a reputation for taking recipes apart and reforming them, nominally – and this was seen thrice today. First, the veal and langoustine was a luxurious reinvention of the common bistro combo of steak and prawn – surf and turf – that can be found on most menus. Secondly, the plat principal was a traditional concoction straight from the Côte d’Azur that was dismantled into its rudimentary elements then plated as primarily as possible. 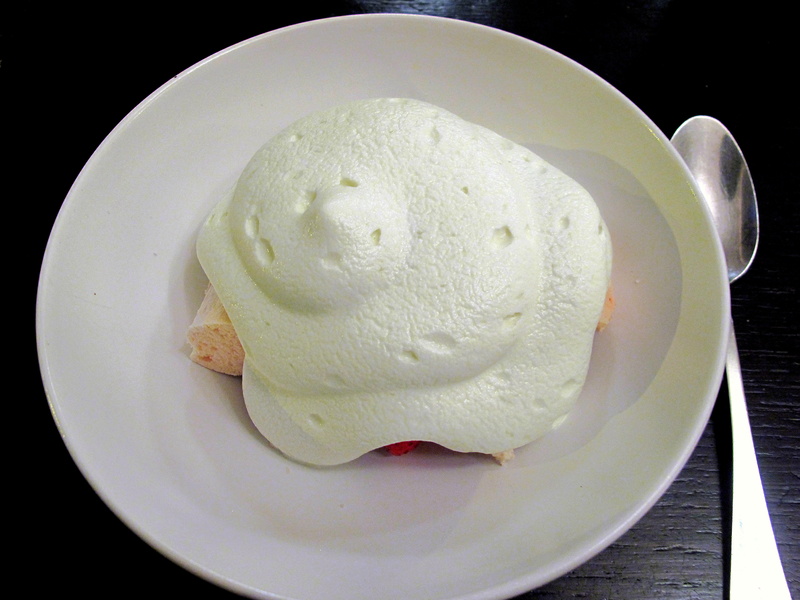 Lastly, as mentioned, a reworking of classic meringues with red fruit was a light, bright note upon which to end. Creativity is key to this chef. 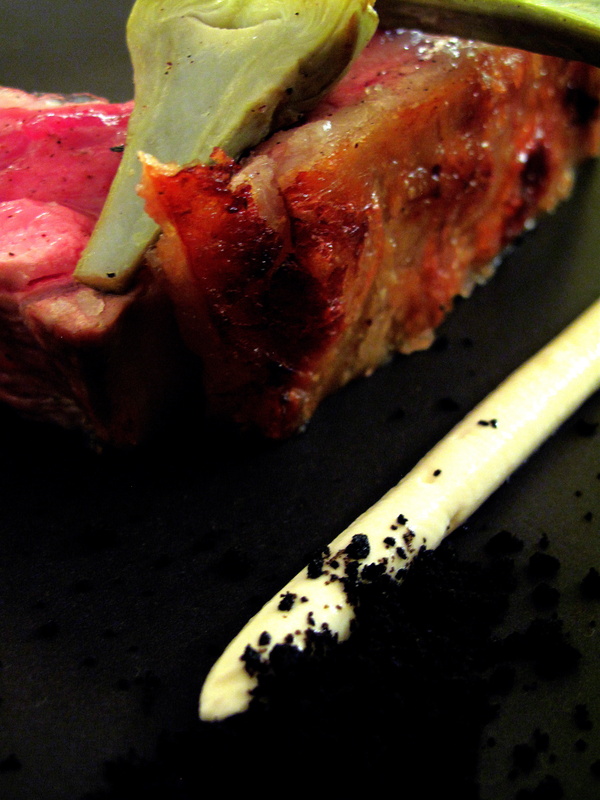 He is eager to ‘amuse’ and excite the diner ‘with very distinct flavours colliding and eventually marrying’. To achieve this, he is not afraid to stray from the hip locavore label and to include ingredients from around the world, thus underlining his role as a leader amongst the Génération C collective which, started by his former mentor Choukroun, aims to offer an affordable cuisine of modernised classical techniques and foreign flavours. His cooking is not fusion though, but informed by his many travels throughout South America, the Middle East, Asia as well as Southern Europe. This modern, cosmopolitan theme is in stark contrast to the very restaurant wherein it resides: contemporary cooking in a classic bistro; colourful food within sombre walls; cold ingredients served in a warm setting. The only pattern that pervades both plate and space is an explicit lack of clutter and fuss. 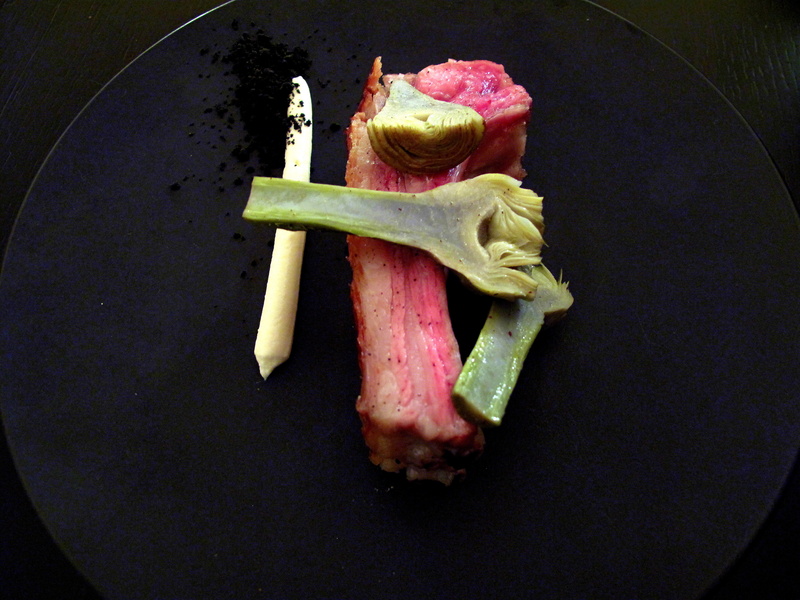 This minimalism was not limited to presentation, but extended to the treatment of ingredients. Cooking was considered an extravagance; heat, an indulgence. Tonight, everything – meat, fish, vegetables – was either raw or barely-heated through. Furthermore, this lack of material modification also meant that products remained, as much as possible, in their original states – for instance, the legumes were often whole or just sliced once, at most twice, and also served with their skins. Saucing too was sparse with nothing thicker than a light (but concentrated) jus employed. But none of these are criticisms, necessarily. On the one hand, there could be two negatives construed from this. First, regarding effect, there is the almost inevitable corollary to such methods as these – a new menu each day that depends on the least number of flavours, bound by almost nothing but themselves, merging for maximum effect will sometimes ‘miss’. Sometimes, this relentless deduction of elements will be to the detriment of the dish. Secondly, regarding cause, it might be argued that perhaps the chef is not exerting himself to his fullest and thus not revealing his true potential with each plate. Although I am almost embarrassed to admit it, this thought did niggle at me afterwards. On the other hand, this haute cuisine at reasonable prices – Aizpitarte’s ‘cuisine de vagabond’ – is a worthy pursuit: ‘I don’t want to only have rich patrons. I want a place where my friends can come from time to time; a place they can afford. So it’s really important for me to have both affordability and creativity’. The aforementioned concessions may be the costs of such an egalitarian ambition. Whilst in admitting mood, I must also confess that expectations possibly played some part in my muddled enjoyment of this meal. Given the chef’s inclusion in Gelinaz! (a clique of cooks) along with the likes of Fulvio Pierangelini and Davide Scabin, and later, together with the latter, his contribution at Cook it Raw!, working side-by-side with Redzepi, Barbot and Adrià, among others, I basically wanted le Chateaubriand to surprise and impress me. In reality, it was only pleasing – and maybe this is why my emotions are conflicted between the fact that dinner at Le Chateaubriand is arguably the finest meal one can have in Paris for under fifty Euros and my certainty that a talented chef offering one menu should be offering a great menu – which evidently was not always the case this night. Nonetheless, there were positives; there was potential; and there is always the attraction inherent in the gamble that an ever-changing carte entails. I would go at least 3 times if you can. 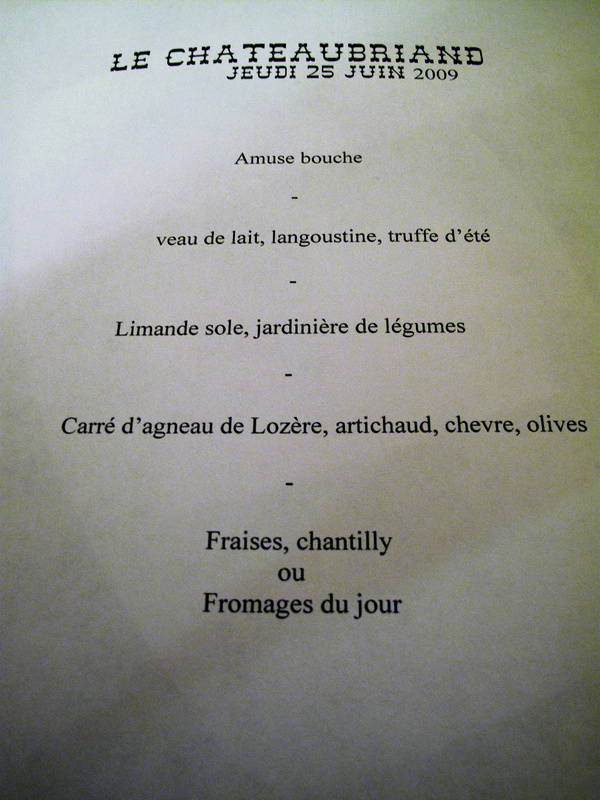 I tried to squeeze into second service here (on the same day I’d had lunch at l’Arpege!) but the canny locals beat me to it. It remains high on my list as this sort of cooking really interests me. With so many sources of food writing these days, I think it is becoming challenging for chefs to surprise or even to live up to expectations. A challenge is, of course, a good thing. But I try to clear my mind of as many preconceptions as possible when first dining somewhere, as much to enhance my own experience as to give them a fair chance! 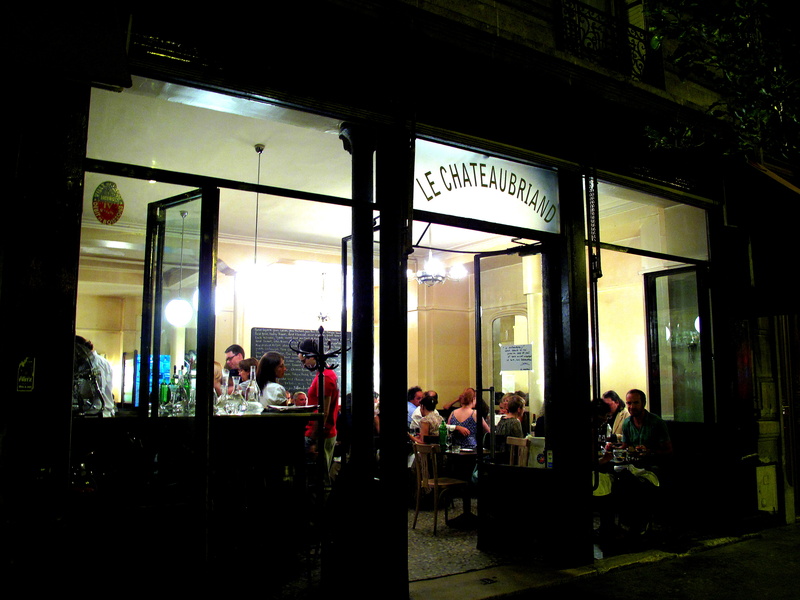 awww… i am moving to paris next month and le chateaubriand & l’astrance are the two restaurants i’m eager to try in the first week. nonetheless, i heard the more creative dishes at le chateaubriand are served during dinner time, so hopefully i’ll have a better experience. 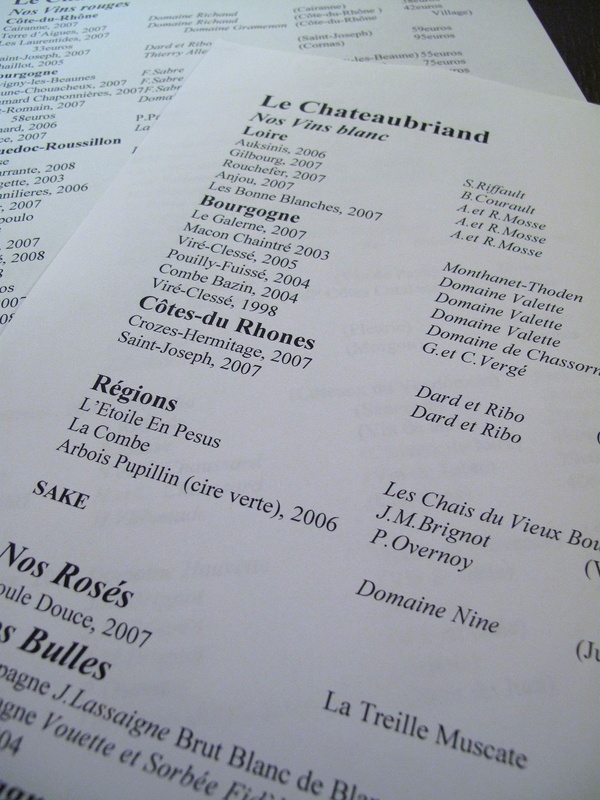 Once, at “Le Chateaubriand”, I could choose between 3 plates … But now the Menu is UNIQUE … I like the pleasure of choosing, hesitating – and do not quite like their new no-option-at-all-it-is-like-that … Besides, I can recommand you the very small wine bar just in front, called “la cave du daron”, really pleasing … You can have a drink, buy a bottle when it is closed everywhere else … Cheese and charcuterie from small producers goes along, really nice (very parisian and so little) place. @Mr. T – Better luck next time! Well, it is difficult not to have any expectations at all. I mean, there is a reason I choose restaurant a over restaurant b – the reason normally being that I expect to enjoy my meal more at one than the other. Those expectations are of course derived from all sort so of places. It is a thin line, regarding creativity. It should always of course be purposeful and not just for its own sake. I mean I like to think that if I went somewhere and the chef served me a simple steak, he would still be able to impress me on quality and execution alone. Did you not think this menu creative enough? Nonetheless, two excellent choices for different reasons. Let me know if you would like any other suggestions. @Rosemary Thank you so much for the tip. As regards the menu, I really do not mind not having a choice. To be honest, I rarely read many menus these days and at my favourite restaurants I like to let them surprise me when I visit. So, as long as they are willing to accomodate any allergies/vehement dislikes/etc, I will not complain. I completely understand the reasons for one carte too. 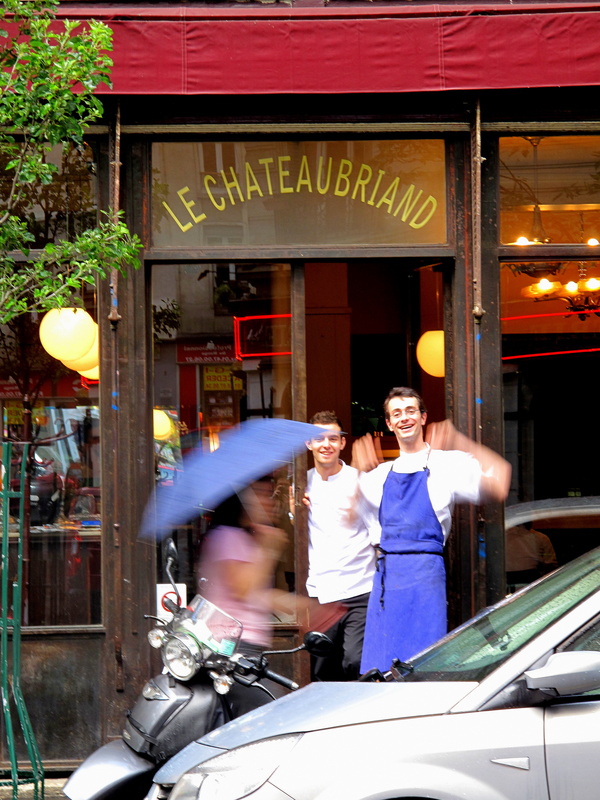 Thank you for the answer – You added some nice food pictures who made me (perhaps…) wanted to return to the Chateaubriand ! I am happy to hear you liked the photos – but do visit Trine’s site (link below) for even better ones. although very well priced, le chateaubriand is quite underwhelming. wit is fine,but flavour is the aim with so much of my meal being really quite flavourless, the creativity is lost. i went not expecting much and can say, that’s what i got,but for that price how can one complain? the floor staff were losing it and the general feel of the room was chaos. my menu consisted of tuna which was oxidised and dry. mussels and heirloom tomatoes, which was okay,but extremely acidic, killing off the natural chenin i was drinking. 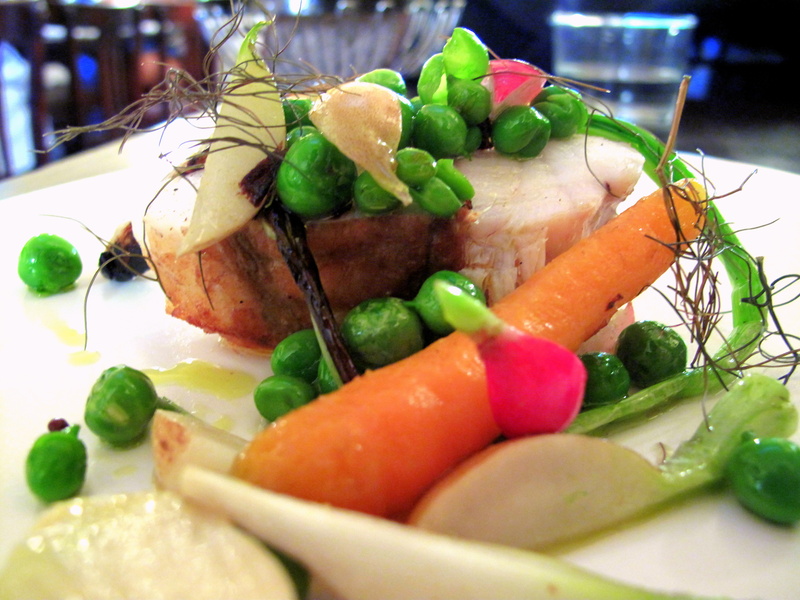 an extremely flavourless piece of monkfish with even more flavourless carrots, plus carrot foam???. veal rose and beetroot that was bland and the “chantilly” to finish, which was the most flavourful of the dishes,but the “chantilly” split after a few mouthfuls and looked quite unappealing. this place is a classic example of hype and emperors new clothes. there are many places like it around the world that are so much better. roll the dice,but make sure they’re loaded! Hi Luke, thanks for commenting. I appreciate what you have said, but I am still willing to give it another go (especially considering the price). I had an absolutely amazing meal there. It’s definitely on my list of ‘musts’ every time I’m in Paris. I know I’ve heard some random negative reviews as well, but my experience was amazing. The pigeon I had, I could have died for. @Melanie Thank you for the link. It’s always interesting how far apart different people’s opinions of the same place can be. I’m glad you like it though! One of my favorite place in Paris (said by a parisian). The main issue is to have a table at french time (8:30 pm): if I can remember, they force you to book at 7pm (US/UK time for diner…). I am pretty sure that they open only at 8.30pm. However, the best time to get there is around 10pm. Perhaps you could help me to find a very simple restaurant; their photocopied menu was on the tables, playing also the role of table cloth, after the meal, the waiter would write the bill on the blank parts of the menu. Nothing glamorous about the decoration of this restaurant, but the food was superb! I found this restaurant by chance on my last day in Paris, in one of my trips in the early 80s. I had walked all day throughout Paris, it was late, I was tired and hungry, and felt very attracted to the unconventional look of this particular restaurant and went in. I had eaten in at up and down market restaurants and street markets kiosks. I love French food, but the meal I had at the restaurant in question, was the best. Sadly, I have not been able to locate this particular restaurant, if it’s still around, I would love to go there again. Can you help? @Tore thanks for the suggestions. I agree that this spontaneous, relaxed sort of restaurants are proving increasing popular. le Chateau in Paris, Momofuku in NYC, St John Bread & Wine in London… some are less ‘rock and roll’ than others, but I think the principles are similar. Great posting, looks very interesting. I like the creative plating. How I wish I could go and visit there. I am going to eat there next week and i am very exited about the restaurant! i was just wondering… How mutch does the menu cost? I cant seem to find it enywhere. Thanks Foodsnob for the review. I finally made it there about 2 months ago (a quick 3 days travel to Paris from Montreal). I got caught in the huge buzz around it, but I am fine with that: buzz does not mean the place is bad, just means people are talking a lot about it. First things first: it was packed on that night I was there, so the marketting behing it deserves the highest praises. (1)honestly, not a rip off at this price. (2)Had a little chit chat with the Chef. He will mark some of his patrons memories (unique, cool,rebel,different, funny, intriguing). Now the downsides: this type of new bistro trend (laid back, cool looking, buzzing ambience, modern/creative looking relatively simple and affordable dishes )… well, there are hundreds like this opening doors around North America, Europe. I did not review each of the food items since we were a bunch of friends there with sole purpose to enjoy some good time and not bother with food analysis, but what I gathered from the food I’ve sampled was that it came in cool presentations, turned around the latest widly spread cool new bistro concepts we see a bit everywhere (they do it with a bit more elegance, talent, refreshing creativity –than the average — I shall confess ), but this was by no means what I would expect in the top 15 of S Pellegrino’s best tables of the world. How can I make a booking from aboard. This restaurant has absolutely declined since it became known in the internaitonal prass. The service is rushed and arrogant and the portions absolutely ungenerous, even by French standards. 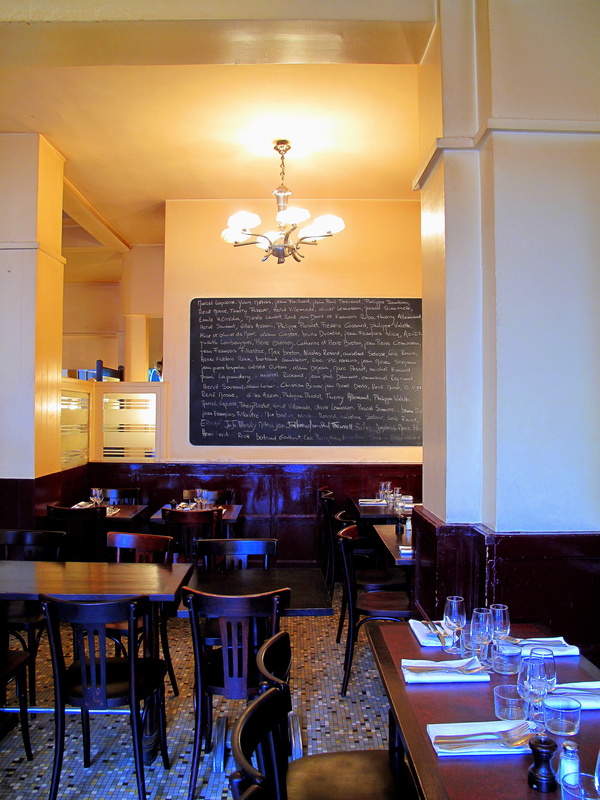 And the food is more expensive and definitely no better than some equally minimalist restaurants in the neighborhood such as the Vieux Chêne or L’Ebauchoir. Thank you for the recommendation. I just made our reservation and look forward to eating there! Our dinner was so wonderful! It was obvious we were given the “American early reservation”, but we did not mind. I loved the simple but old decor, the no selection menu, the staff, everything. The food was all delicious and every course was a surprise. I would love to return one day!